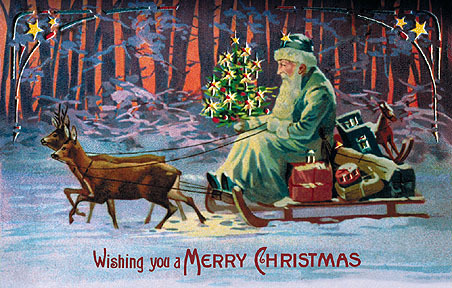 In my Santa Quiz post, I brought up the theory that some hold that Santa is depicted in red and white as a result of a highly successful Coca-Cola ad campaign in the 1930s. 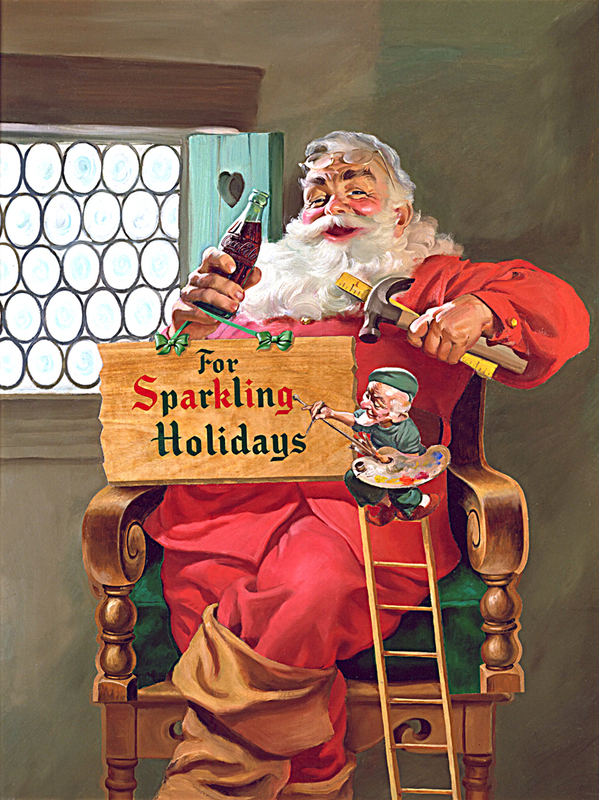 In fact, Coca-Cola takes full credit for the modern-day Santa image. 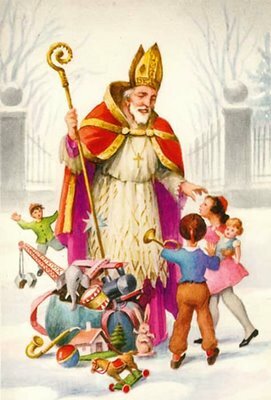 Coke claims that, prior to their sprucing up of Kris Kringle, he appeared in a number of guises from a green elf to a somber Saint Nicholas, and even a gaunt figure dressed in animal skins. This claim is hotly disputed. 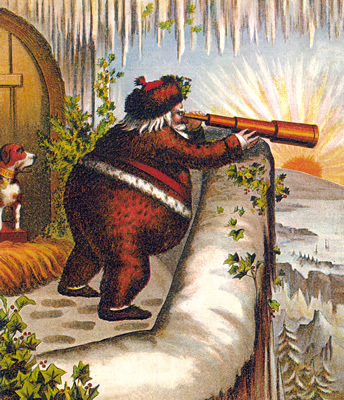 Of course, many of Santa’s attributes come from the American illustrator, Thomas Nast, who drew Santa for Harper’s Weekly between 1863 and 1886. In Nast’s drawings, the break with Santa’s religious past is clear. Nast drew Santa as a pear-shaped jolly figure with a flowing, white beard. His image of the big man was a composite of his former drawings of the drunken Roman god, Bacchus, as well as the corpulent political boss, William Tweed, who ran Manhattan for much of the 19th century. Nast also admitted that the was inspired by the furs of the Astor family (from where the family originally derived its wealth) when he designed Santa’s fur-trimmed clothing. However, there is an alternate theory as to why Santa dresses in red and white, and as to why he behaves in a jolly manner. 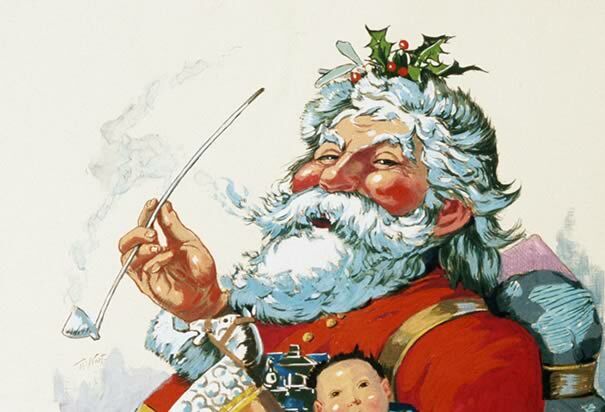 A rival suggestion for the origins of much of Santa’s paraphernalia — his red and white color scheme, those flying reindeer, and so on — is much more fun, less commercial, more scientific, and somehow more appealing than Coca-Cola’s version, because it is so politically incorrect. 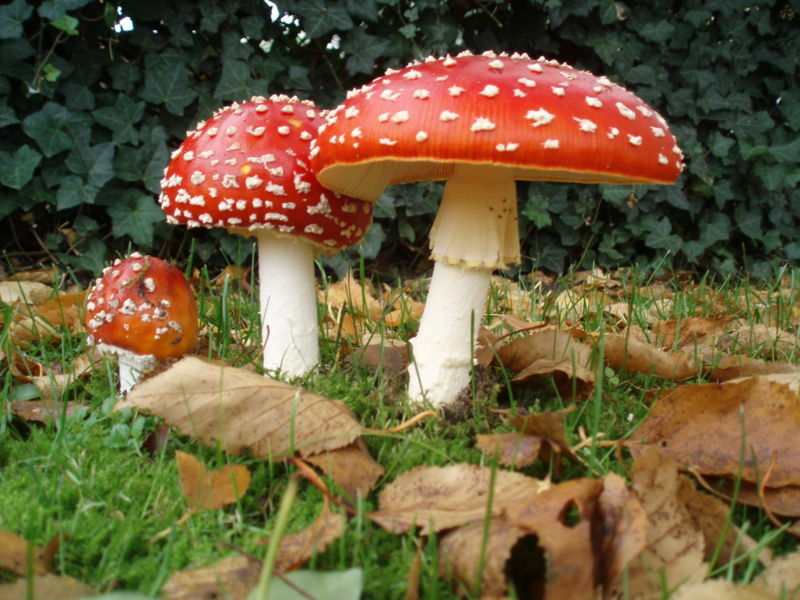 Patrick Harding of Sheffield University in England argues that the trapping of the traditional Christmas experience owe a great deal to what is probably the most important mushroom in history: fly agaric (Amanita muscaria), the recreational and ritualistic drug of choice in parts of northern Europe before vodka was imported from the East. Each December this mycologist dresses up as Santa and drags a sleigh behind him to deliver seasonal lectures on the toadstool. The garb helps Harding drive home his point, for Santa’s robes without doubt honor the red-and-white-dot color scheme of this potent mind-altering mushroom. In Lapland [Northern Finland, above the Arctic Circle], the village holy man, or shaman, took his mushrooms dried — with good reason. 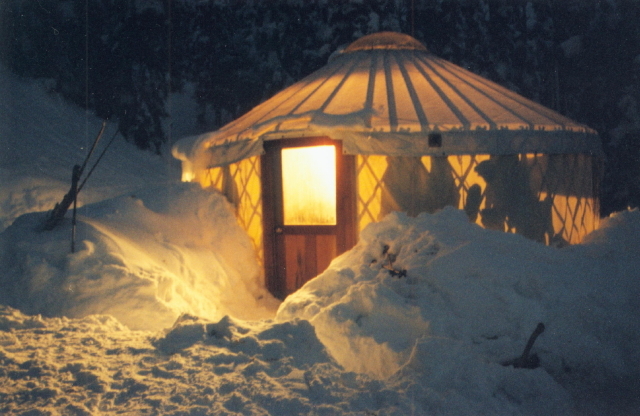 The shaman knew how to prepare the mushroom, removing the more potent toxins so that it was safe enough to eat. During a mushroom-induced trance, he would start to twitch and sweat. 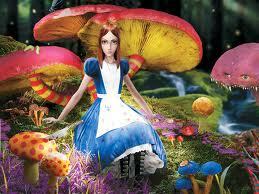 His soul was thought to leave the body as an animal and fly to the otherworld to communicate with the spirits. The spirits would, the shaman hoped, help him to deal with pressing problems, such as an outbreak of sickness in the village. With luck, after his hallucinatory flight across the skies, he would return bearing the gifts of medical knowledge from the gods. Harding uses the shaman’s urine to link reindeer to the myth. For one thing, reindeer were uncommonly fond of drinking human urine that contained muscimol [the active ingredient in fly agaric]….Such was the intensity of the drug-induced experience that it is hardly surprising that the Christmas legend includes flying reindeer. 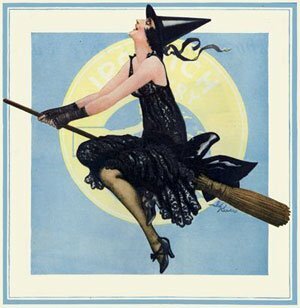 Witches soar for related reasons: a witch who wanted to “fly” to a sabbat, or orgiastic ceremony, would anoint a staff with specially prepared oils containing psychoactive matter, probably from toad skins, and then apply it to vaginal membranes. Friends, I will spare you Highfield’s derivation of the British expression “to get pissed” (meaning ‘drunk’). Let’s just say it involves a communal sharing of fly agaric after the Shaman is through with it. 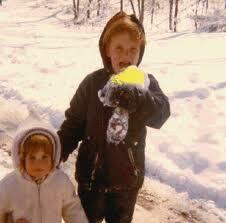 When your parents told you not to eat yellow snow, there may have been an alternate reason for such warning. Will you ever look at Santa, reindeer or witches the same way again?